for autographed copies, click on "Contact Us" at top. (1978), with a team she formed and managed herself, was the best by a woman until 2005. 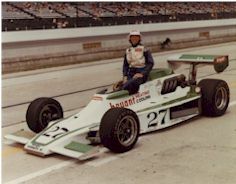 She set fastest time of day at Indianapolis on May 7 and May 22, 1977.
top-ten finishes in both Indy-car Championship racing and in NASCAR Cup racing. 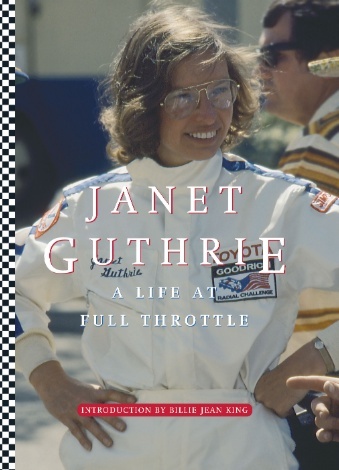 Her fifth-place Indy-car finish at Milwaukee in 1979 was the best by a woman for 21 years. Top Rookie in five NASCAR Cup races. and an aerospace engineer. Her helmet and driver's suit are in the Smithsonian Institution. Hall of Fame. She was inducted into the International Motorsports Hall of Fame in 2006.